All kits are universal, supplied with cables that are unfinished at one end, so that they can be cut to length. 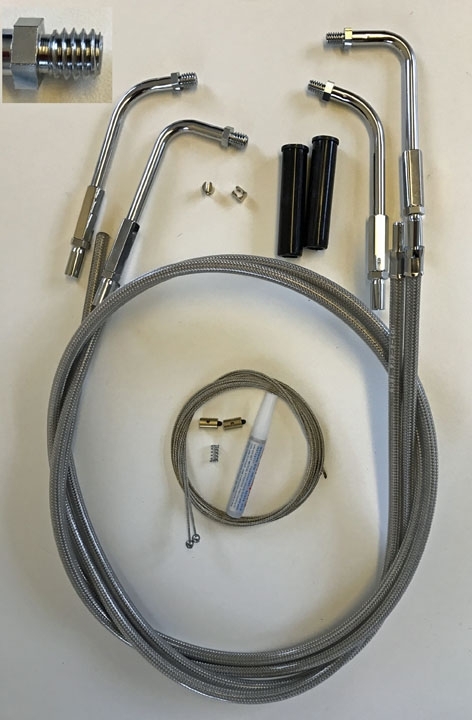 All of the connections are designed to fasten securely without the need for soldering, so these are proper DIY kits for 'home mechanics', made to the high standard expected from Venhill. The Dual Throttle and Idle cable kits come in both push-fit and threaded versions, to suit a wide range of models. Extra long – at 1350 mm / 53 inches – they allow for bikes fitted with high handlebars, and come with either 90° or 75° bends, in a choice of black or braided steel outers. The black cables have longitudinal conduit (not coiled) which won't pinch on bends, so they won't restrict cable movement. The Clutch cable is also made extra long - at 2080 mm / 82 inches - and comes in black or braided steel finishes to match the throttle. Like all Venhill cables, they're designed to deliver improved performance and durability, along with smoother action. The Dual H-D Throttle and Idle Cable kits (push-fit and threaded) retail at £37.08 with a black outer and £61.80 in braided steel.